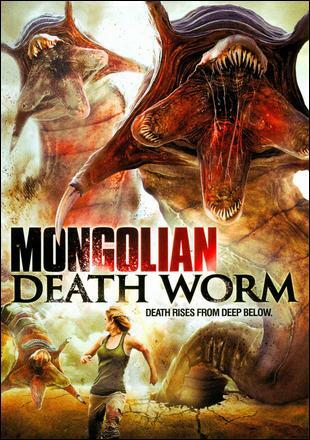 We’re back in the glorious world of films where the name does all the hard work for you – no-one will pop this on thinking “where’s the sensitive coming of age story?” The only question it really poses is whether it’s set in Mongolia, or maybe the death worms have emigrated to the USA, but that’s answered sharpish. As so many SyFy films have demonstrated before, try not to drill…well, anywhere, just to be safe, but if you do have to drill, make sure there’s nothing weird about it. Melting millennia-old permafrost to get at the oil counts as weird, yes? A multinational has set up a drilling operation in Mongolia, and we’ve got two main locations – what looks like a real oil refinery (filmed in Texas, they do a good job of blocking out any nearby civilisation); and a small village with a whole bunch of sick people and a few Americans from a Doctors Without Borders clone organisation. One of them is Victoria Pratt, star of two of my favourite cheesy sci-fi series, “Mutant X” and “Cleopatra 2525”; she was 40 when this film was made but could comfortably pass for 30. Stupid genetics! I look like an old boot, and I’m five years younger than she is. 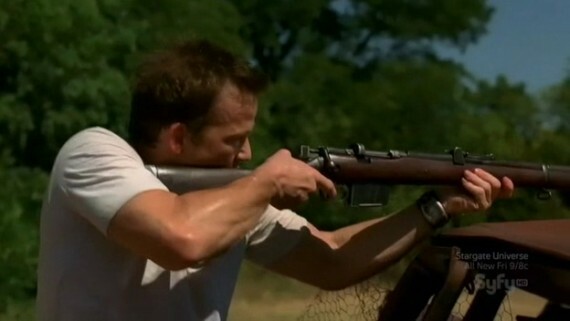 Our other name star is Sean Patrick Flanery, from “Powder” and “The Boondock Saints”. He’s a sort of Han Solo / Indiana Jones crossover, a smuggler with a heart of gold who’s trying to find the mysterious tomb of Genghis Khan which should be stuffed with gold and so on. And guess which creature is, according to legend, supposed to be guarding the tomb? There’s a lot of driving in this film. I’d reckon a good third of the film is solidly set either in cars or by the side of the road, which is a bit more than any film that’s not specifically about driving needs. Okay, it’s got an interesting visual aspect to it, with the completely empty horizon and “roads” made from loose rock; but by a certain point I was begging them to put down some roots. But on the other hand, they’ve got sets which are vastly superior to 99% of all SyFy Channel movies. The oil place looks like a real oil place; and the village, while it may be completely inauthentic re: Mongolia, looks great and different to most other low-budget movie villages. So, you have to weigh up whether the stupidly large number of driving scenes outweighs the rest? I know films aren’t shot in order, but there comes a point about halfway in where it looks like Flanery has twigged that he’s making a cheap silly SyFy film and decides to roll with it. He starts sneakily throwing up “the horns” (the “sign of the devil” hand gesture) when there’s no real need to, cracking jokes and looking relaxed. The villains he’s pitted against – a Mongolian gang leader and the boss of the oil plant – are so comically evil that all they were missing were moustaches to twirl; and there’s actual chemistry between him and Pratt, an age-appropriate couple for once. The worms are pretty rough, special-effect-wise, and it could stand to be a bit quicker, but it’s a surprisingly enjoyable film. The women in the film stay fully clothed throughout, aren’t subjected to any unpleasant sexual innuendo, and are mostly in charge of their own destiny, which is a pretty gigantic thumbs up (sadly). Strong acting, a sense of humour and an interesting visual aesthetic set this apart from your average SyFy movie. 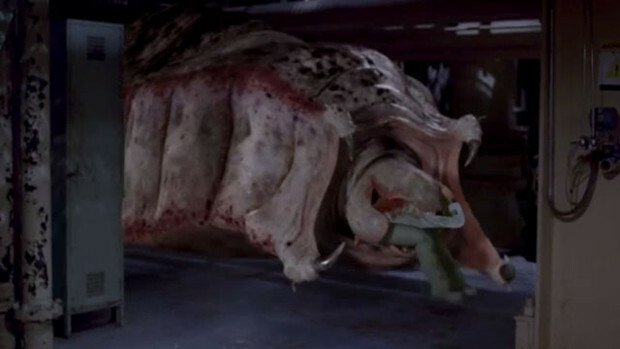 We are, of course, contractually obligated to mention “Tremors” when talking about giant underground worm-monster movies. The thing is, they’re not really all that much alike. So, feel free to ignore this, but I just wanted you to know. The main difference is that “Tremors” is a great deal better than this, and indeed all other SyFy movies ever. But that shouldn’t stop you from enjoying this one. 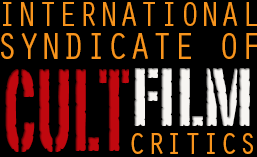 This entry was posted in Reviews and tagged Cleopatra 2525, Indiana Jones, Mongolia, Sean Patrick Flanery, Sean Patrick Flannery, SyFy, SyFy Channel, The Boondock Saints, Victoria Pratt. Bookmark the permalink.